Wondering where that ancient Israelite city is located that you just read about? Check out the map the Resource Guide will find for you, zooming-in or making it full-screen - or both. Quickly see all the verses relevant to the current verse you're reading. Tap on the cross reference, a pop-up window will appear, and then you can quickly navigate to the corresponding verse - without ever leaving the passage you're reading. Learn more with information displayed in visually-appealing ways. Not sure what charts you have? The Resource Guide will automatically pull up charts from any relevant sources while you're studying. Reading about a person, place, or thing but don't know what it looks like? If this book has an image of what you're looking for, the Resource Guide will let you know. Just glance under "Image," and tap to see the photo enlarged. Desde el momento en que decida hacer suya esta Biblia, sabrá que es un clásico. 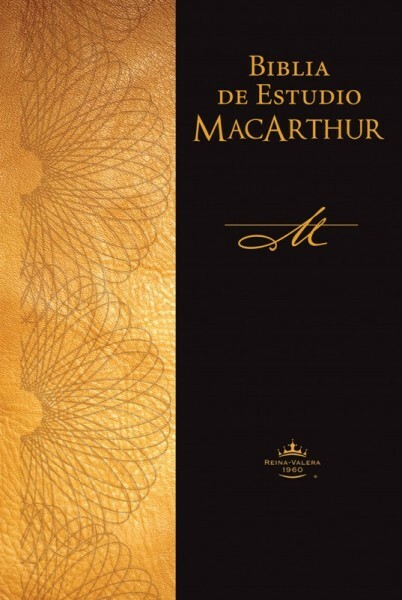 La Biblia Notas de estudio MacArthur es ideal para un análisis profundo y objetivo. El doctor John MacArthur compila en esta obra más de 35 años de labor pastoral y académica con el fin de crear la Biblia de estudio más completa a disposición del lector. Ninguna otra Biblia de estudio explica con tanta eficacia el contexto histórico, desarrollando el significado del texto y dándole un valor práctico para su vida. NOTA: La Biblia Notas de estudio MacArthur de productos Sólo contiene el La Biblia Notas de estudio MacArthur . El Reina Valera 1960 - RV1960 de texto se pueden comprar por separado aquí . El Reina Valera 1960 - RV1960 texto (o la traducción de la Biblia de su elección) utiliza poderosa función guía de Fuentes para vincular estos dos recursos.